I have to admit I tend to feel a bit uncomfortable with the first part of this episode. When I’m re-reading the manga I feel an urge to skip over this chapter there as well, for the same reason. I guess it’s sort of sympathetic embarrassment, or something like that. Seeing Aoba get a swelled head and get carried away now that she’s officially a lead character designer on this new project just makes me feel bad for her. I can understand where she’s coming from, since becoming one of the official character designers for the game feels like it should be something special, and so she ends up feeling like she should be special: more capable, more important. And certainly the position is special: she goes to meetings now that she never would have been at before, giving her more knowledge and perhaps even some voice in the state of the game that would normally be well out of reach for someone at her level of experience. But despite all that, the truth is that her level of experience is still fairly limited. There are a lot of things she doesn’t know, details and complexities of working in 3D, difficulties in art and design, potential troubles when transferring rendered models to playable forms, and much much more. Getting this position is good: it too is an experience that will help her grow, but she needs to recognize the areas where she is weak and be ready to listen to her coworkers who have been there longer, and who still have much to teach her. 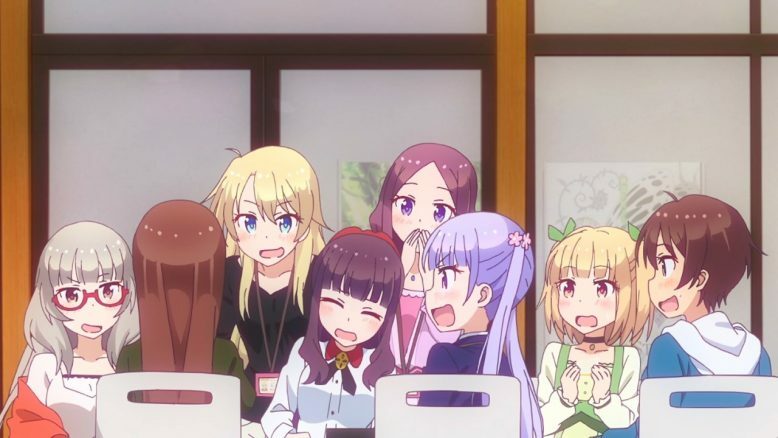 Fortunately, Aoba realizes her error pretty quickly once Hifumi points it out to her over lunch. I feel you with this one, Hifumi. Introvert problems. Other people don’t understand how exhausting “just talking” can be. 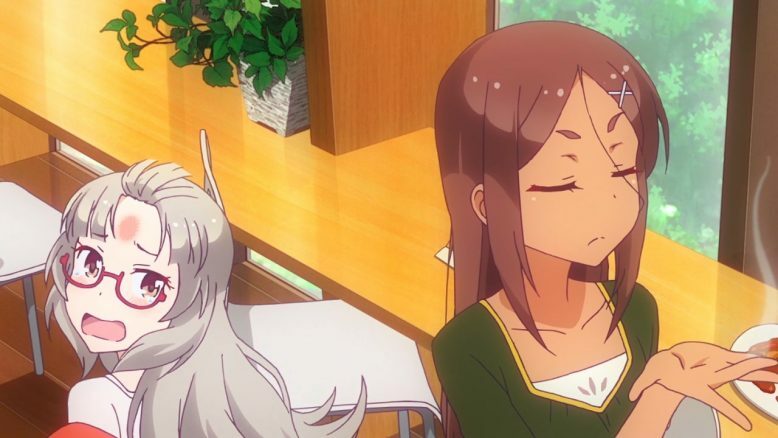 It’s pretty amusing to see Nene and Umiko’s mirroring programming issues. Both of them getting runtime errors on fire-breath animations (although on a completely different scale from each other) is pretty amusing. At least they’re finding the issues now rather than after the product is supposedly complete. 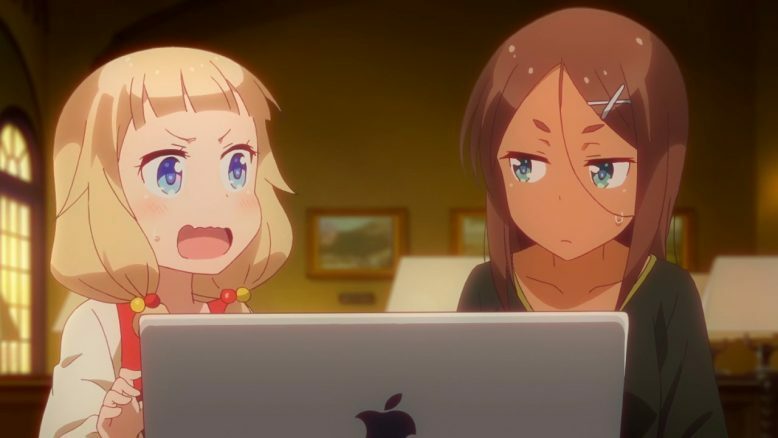 Nene is quite dedicated to her programming, as well, turning down the offer from her unnamed friend to join her in applying for a part time job. It seems that working on her game is consuming all her free time. Of course, given that she wrote the game without a prebuilt engine, what she’s accomplished is pretty impressive. Umiko likes to deflate her ego so she doesn’t get carried away, but a lot of beginners wouldn’t have managed to do what Nene has done here. 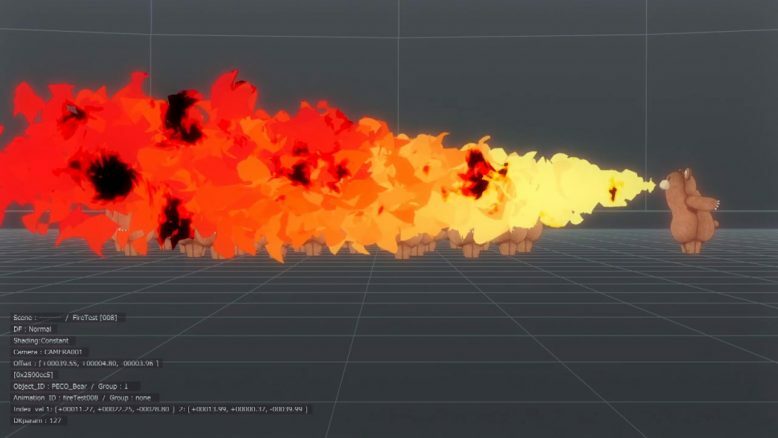 Speaking as a gamer, Hazuki’s request to Umiko to improve the efficiency of the fire breath animation is the sort of thing all game programmers should remember. Lag, glitching, frame drops, etc., are immersion-breaking in games, and can range from being a minor annoyance to rendering a game unplayable. PC games have had a tendency to push for maximum prettiness with minimal concern for playability in the past, although the sharp increase in cross-platform games over the last several years has reduced that issue. Still, that doesn’t excuse lazy coding. Getting the visual effects you want without sacrificing playability is what every programmer should strive for. 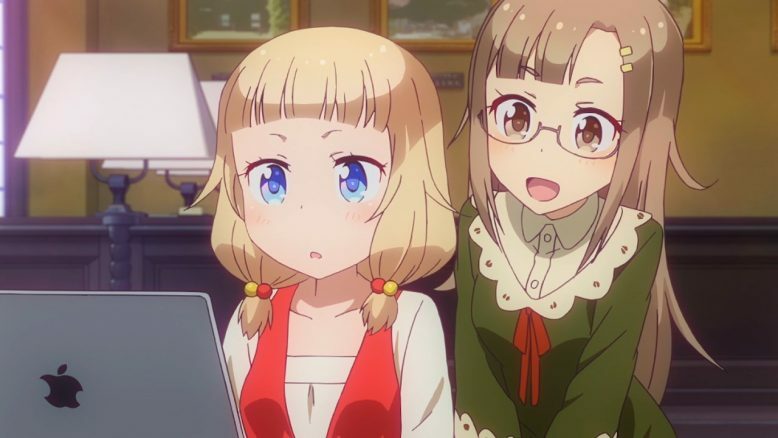 I still find it extremely adorable to see Nene and Umiko staying in touch. Umiko’s “I hadn’t heard from you in a while so I was getting worried” is heartwarming to me, as well as a reminder that she’s actually a pretty kind and caring person under her seemingly cold/aggressive exterior. That she’s willing to take the time to head out to Nene’s university to help Nene with her personal project speaks volumes. She compliments Nene on the things she does well, but chastises her on some of the weaknesses she’s left in: lag on the dragon fire, and shoddy hit-detection. 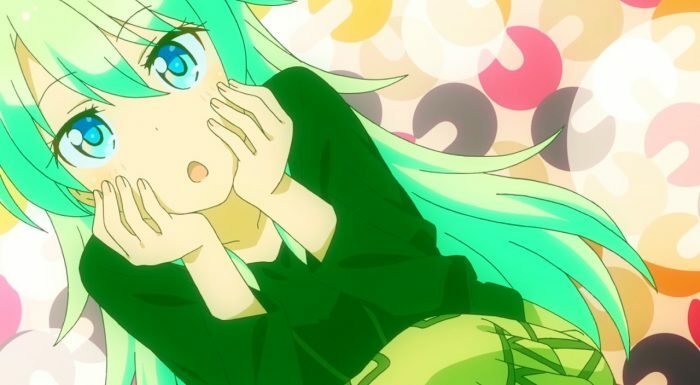 Those are problems that Nene would not have let get by when she was testing Fairies Story 3, so she has no excuse to turn a blind eye to them now. The scene in Eagle Jump’s cafeteria is worth a laugh or two. It seems like Hazuki is going to say something deep… and then she admits that she just hires people who are cute enough that she can overlook any failures they might have. While it’s true that Ko’s experiences with Fairies Story 2 and her failed attempt to be AD there have helped shape her into who she is today, that doesn’t necessarily that that was the best way for her to have learned those lessons. 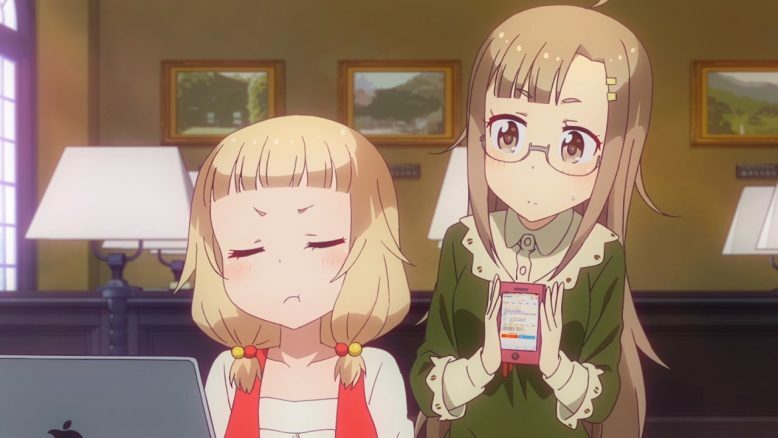 Regardless, Hazuki quickly jumps to asking Umiko for a change to the game specifications, and receives her atomic forehead-flick in exchange. Hopefully she’ll learn to not request them on a whim. And, of course, there’s the lunchbox silliness. 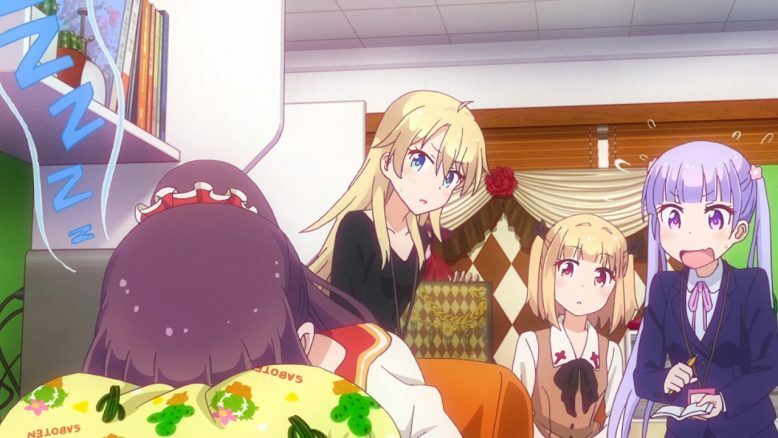 Hifumi clearly brought in enough food for everybody, probably in another attempt to improve her social skills, but she specifically wanted to share the homemade beef stew with Aoba. Ko and Rin butting in and stealing bites with their dense/jealous couple antics respectively definitely was not what she had in mind. My favorite part is definitely Umiko surprising everyone by being unfazed with Hazuki feeding her a bite, and them smiling enigmatically and telling them it’s a secret when they ask who she’d done that with before. All in all this was a decent episode. No real stand-out moments of strong emotion or drama, but then the show has to pace itself. If it used those all the time it would become a different sort of series altogether, after all. And I like it quite well right where it is. A show that is comfortable and enjoyable, but with strong depths and engaging characters that really help bring it all to life. I’m looking forward to more of it. Unnamed college friend is cute. I hope this isn’t the last we see of her.